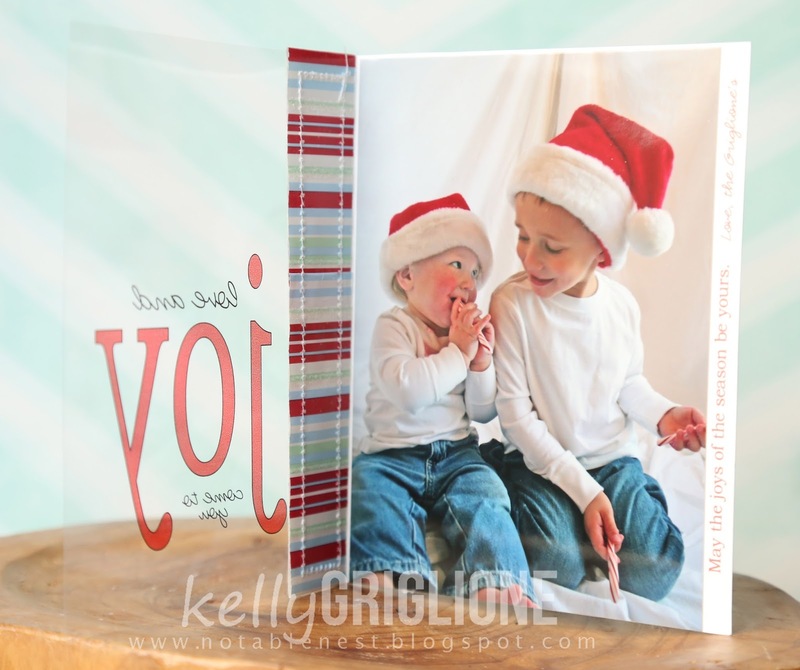 Notable Nest: Holiday Photo Card Blog Hop! Hi Folks! It's Christmas card production time at our house, about a month earlier than usual thanks to the Holiday Photo Card Blog Hop that Darlene asked me to join this year (thanks Darlene!) I've completed a few different prototypes, but before true production starts for the 100+ Christmas cards we send out, I'd love your help selecting which one to go with. I always find it interesting and helpful to learn the background on big projects like this, so before we get to the actual cards, let me share my process. 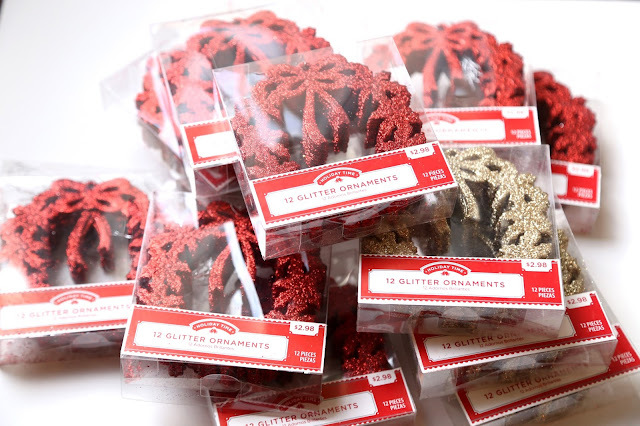 Last year at Walmart I was shopping the 75% off Christmas aisles and found these boxes of flat, red glitter wreath ornaments. At the regular price of $3.00 for 12 they were too expensive, but at 75% off they were only 6 cents per ornament. Now we're talking! With the hole in the middle I could turn this into a Christmas photo card! I'm famous for having grand plans for sale items, flea market treasures, goodwill store finds, and then either forgetting about them or never get around to making something with them. 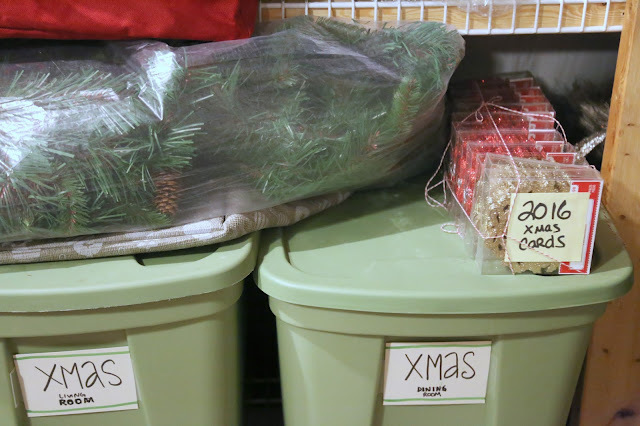 This time, however, I was smart and I packed the sale boxes of ornaments away with my Christmas ornaments, CLEARLY LABELED so I would see them and remember why I bought them. Guess what, it worked! The card couldn't be simpler to make, and that's very important to me since I have so many to send out. 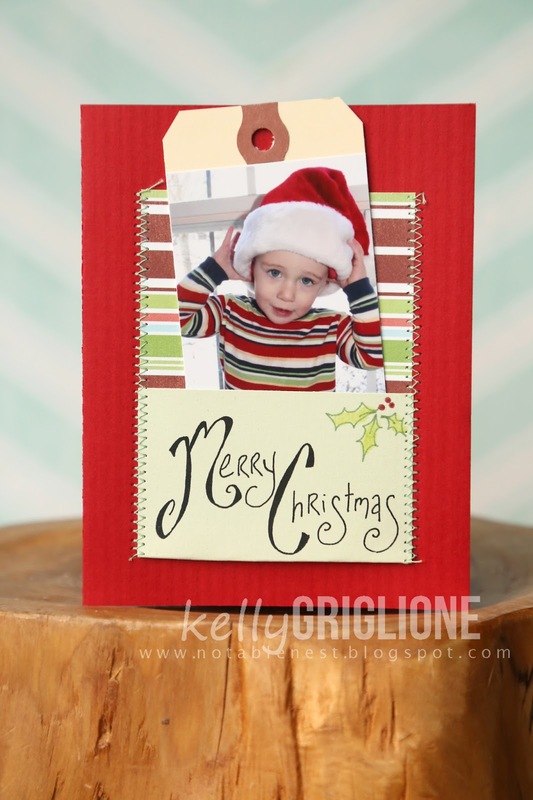 It's no fun being holed up in your craft room all December mass producing cards! The basic premise is to hot glue a photo behind the wreath opening. It's a photo, a card, and an ornament, all in one! I did have to modify the wreath slightly, since the ribbon tails hanging in the center blocked the photo. Don't let something like that stop you from taking advantage of a drastic clearance like this, as once I played with the ribbon tails they easily snapped off. Now it's a matter of choosing which embellishments to use on the wreath. The first version has a red gingham ribbon hot glued to the wreath, as well as a Joy die cut from Winnie & Walter's The Big, the Bold and the Merry Cutaways. The photo has a lot of blues, so the festive red and green colors need to come from the wreath. This is the most mail-friendly version, as it just has a silver foil die cut ribbon from Winnie & Walter's Essentials: Noel Cutaways. Since the photo has so many greens in it, and the wreath is red, I didn't think it needed much else to be festive. The last version version features another clearance item ... a 90 foot role of ribbon that was 90% off at Hobby Lobby, bringing the price down to ONE DOLLAR. That's less than a penny per card, folks! The downside is that it's thicker than I'd like for mailing, since it's such a wide ribbon. To cut down on the thickness I just gathered it in the middle instead of tying an actual knot and secured it with wire. The ends of the wire were perfect for securing it to the wreath so I didn't need to use hot glue. The tag is from Winnie & Walter's Essentials: Audrey Cutaways and the tiny sentiment is from Happiest of Holidays with Evelin T Designs. Now I need your help ... which ornament/card do you prefer? I'm also torn on which photo to use. I generally like close-up photos so you can see faces better, but there's something about the photo of us in the field that calls out to me. Please let me know your thoughts in the comments section, I would greatly appreciate it! Each year on the back of the photo card I make a year-in-review word tree. In addition to keeping people updated on what happened this year, if they want to know, it will also serve to hide the back of the photo. Personally, I like having this for myself so I can remember what we did this year! - don't forget to determine what envelope size you'll need...if it's not a standard size it may be more expensive and/or take longer to order. - consider things that will increase the postage required in the US...like using square envelopes, having the address go on the short side of the envelope (portrait), having the card too thick. - the post office has yelled at me for putting the return address on the back of the card, but so far I have not experienced any service difficulties. Also, here is a gallery of all the photo Christmas cards I've sent out each year, for even more ideas. It was fun for me to see how our family has grown throughout the years! I have a dear friend who tells me she's kept each card and puts them out every year on her mantle, how sweet is that?! 2010 - have your family hold letters to spell out a message, like "joy"
If you'd like more information, there are posts on my blog for the 2012 and 2015 Christmas Cards. 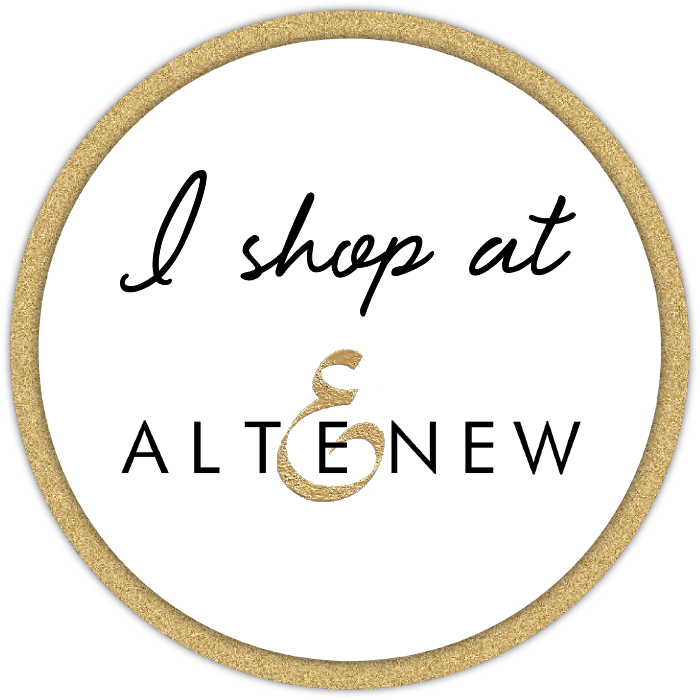 Now back to the blog hop, shall we talk prizes?! Winners will be selected at random from the comments left on each blog hop stop. Be sure to leave a comment on each stop to increase your chances to win! Leave your comments by Tuesday, November 22, 2016, 11:59pm CT. Seven winners will be announced on LiveLoveCards on Wednesday, November 23rd, just in time for Black Friday! Kelly Griglione <-You are here! Great ideas! I especially love how you used the photo on the ornaments. All of these projects are fabulous! You're so creative! Wow, all these are so inspiring - love the sweet photos LOL!!! Of the three creations, I like the one with the word "joy" ... but seriously, all of them are simply delightful. And having the savvy to get your next year's embellishments on the after holiday sales is genius ... and then labeling your box that the contents contain what you need for the next year ... again, genius. 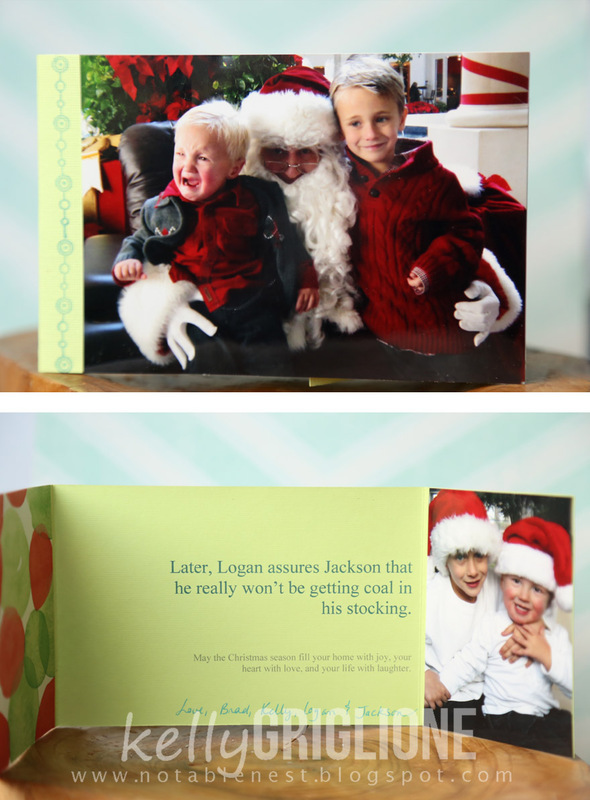 Thanks so much for all the AMAZING tips and your cache of previous holiday cards ... they gave me so many great ideas! I love the photo with all of you in blue, everyone looks relaxed. The gold wreath with the red ribbon is my favourite! They are all absolutely gorgeous. I personally wouldn't know which to pick either. Love the idea of it being an ornament that your family and friends can hang! So cute! These are all adorable, but I think I like the one with the word joy on the top the most. Love the idea of using clearance decorations in this way, so clever! Kelly, you are such a rock star. I love this post...how you came about all your supplies, your calculations and the look back at all your beautiful holiday cards. 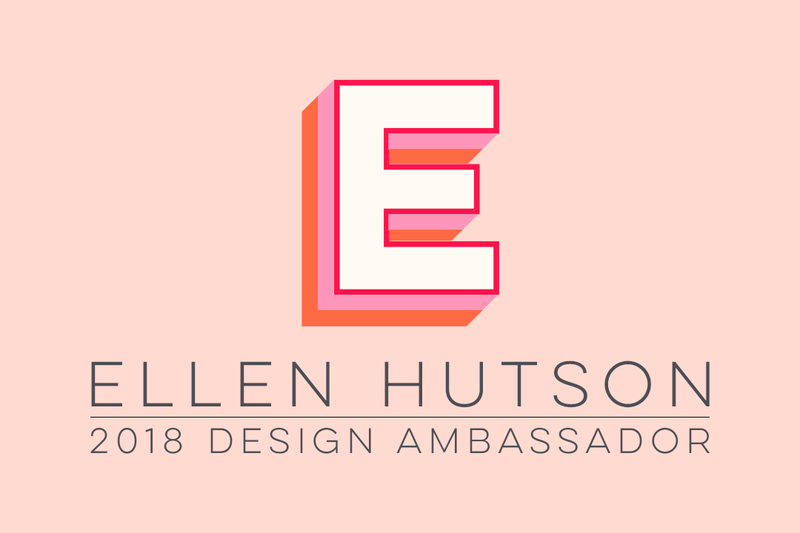 Love this year's design! OH, how clever! I always shop the clearance, but end up not using it... forgetting about it... this worked out really well! Love them all! Thanks for the tips. Personally I prefer the gold wreath with the red and gold sheer ribbon. Just catches my eye and says happy! This is such a great idea! I am famous for the same thing - grand plans for those bargains. Glad to see that you were able to make something out of yours. How awesome that it is an ornament too! Wonderful family photos & memories. I like the far right one best with the Fall/Autumn background colors in photo but would think a red wreath would show it off better. The best part of your post was looking at all your previous photo cards. Your sweet boys growing up warms my heart. I too like close up photos and the one in the gold ornament is my favorite. Genius use of last year's clearance - you have inspired me to hit the sales. :) Thanks for sharing. What a marvelous idea for a Christmas ornament!! Very clever! I am impressed with this quick idea. I make a christmas ornament every year of my grandchildren, thanks for sharing! Just love all these cards and ideas!! Thanks for sharing!! All of these projects are fabulous! All of your cards and wonderful and I love the die cut showing through with he word Merry. Lovely. Thanks for all the tips. WOW. What wonderful ideas both in shopping and card making. Thanks for sharing. WOW... WOW....WOW... what awesome ideas.... they are all so creative and beautiful... but I love the last one.. love to you. Love your designs ... such great inspiration. Great card ideas! I really like the gold one. Good luck deciding! 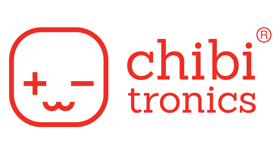 Amazing ideas and projects. I've made many picture ornaments of my niece and nephew for my sister in the past. It's like keeping a scrapbook. I like the simplicity of the one in the middle with the silver die cut bow. So simple but absolutely beautiful! I love the word tree on the back. Thank you for sharing. Cute and nice to save through the years. Very cute and clever ideas! you are AMAZING! What a treasure for your boys and you! The photo wreath is a fun idea and I love seeing all your past projects. Love this! 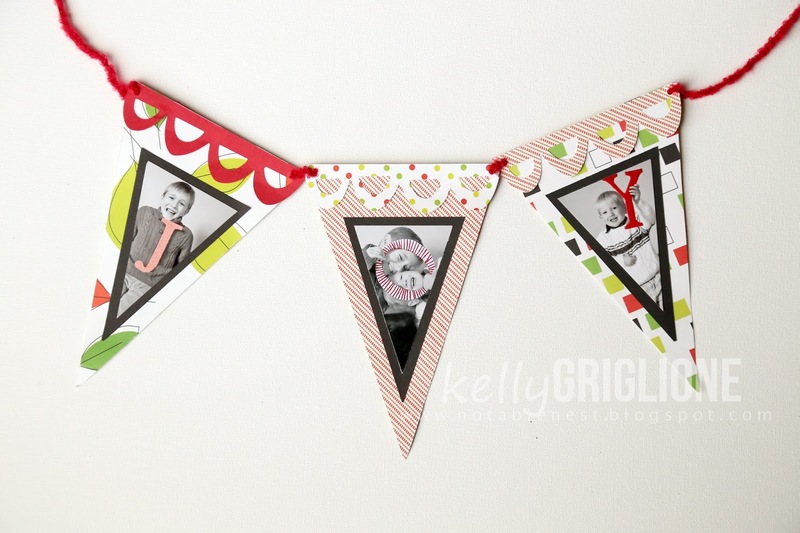 My favorite is the gingham ribboned "joy" with its current photo. Just love everything about it! Oh, goodness! I need to look through your prior year cards as well! But, what a great way to use a clearance find! My favorite is the joy & gingham bow and all of your pics are great (love the gold wreath photo). Love your word tree as well! Thanks for the awesome inspiration! I love the idea of keeping the year in review on an ornament, we do this in our Christmas card - Bullet points - Like my Bullet Journaling! LOVE IT! Something new to try! Thank You! I just love reading your tips and beautiful wreaths. I would never have thought of using the shape of a tree for the year-in-review words. I bet that takes a lot of planning! I like the close up photos and the simple red ornament in the center. Great bargain! Wow are you clever, creative & thrifty, Kelly! You can't go wrong with any of those wonderful family pictures, but I especially love the center wreath & the picture you've used in that one! Happy Holidays! love all the cards but especially the one with foil ribbon as all my cards have to be mailed. Love the idea of the Christmas letter on the back. Great card. Love this year's photo ornaments! This is a really good idea, I have heard of people publishing a yearly newletter to family and friends but to post it on the back of a phot ornament that is a great idea. Thanks for sharing. Great photo ornament! Thanks for sharing your cards through the years - I love the way you do your "year in review." 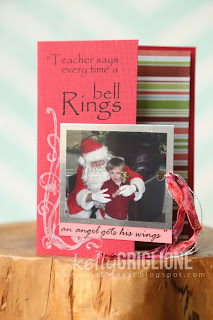 What a clever card/ornament, love the thriftiness of it, and your bulletted highlights on the back! Such a clever idea -- love it! Love the back, too. Also loved seeing your cards from years past. Wow! Great photo cards and at a bargain too! I love the tree review idea too. Cute idea of a photo ornament. I like that you have a summary of the year's events on the back. Thank you for sharing. What a great ornament idea. I love how you record your yearly highlights on the back. and intensions, only to forget about them! wreath with gingham bow and the picture in the field. Your picture frame ornaments are so adorable! Your cards are so cute. Love all your amazing ideas. Beautiful photo cards. I love the ornament and the family info on the back, very cute! 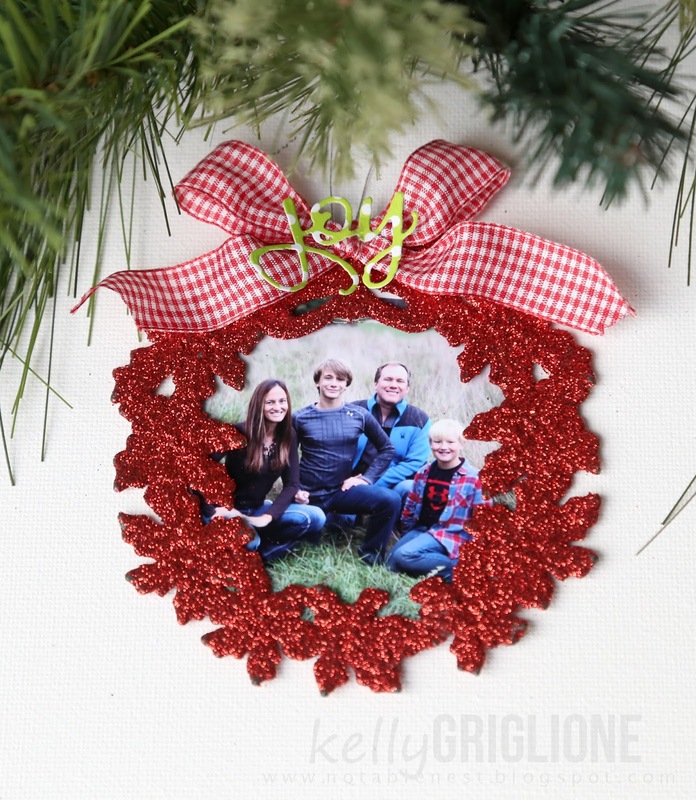 Love the wreath framing your family photo, Kelly! And, it was fun to see your past photo cards, too. Great idea. My favorite is the first one with the gingham ribbon. I like this photo the best too. So many fabulous ideas! Love the keepsake ornament and the tree shaped Christmas letter - both so clever. 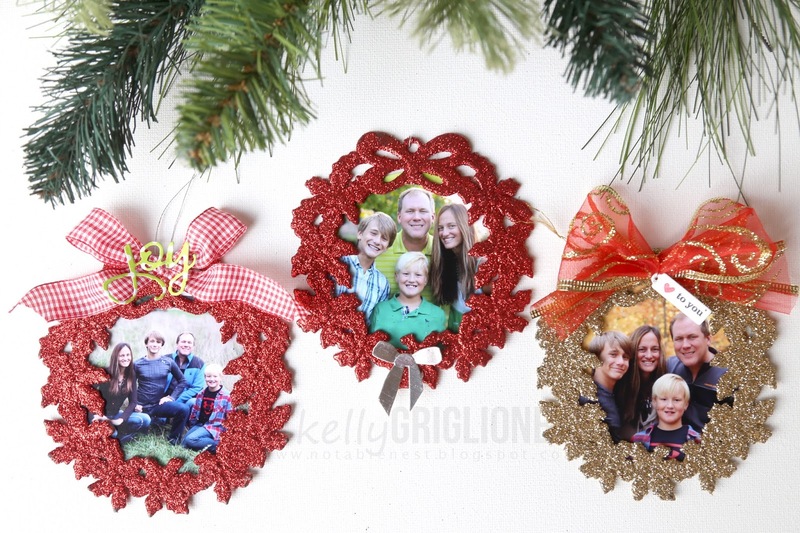 Ooooh I love your glittery wreaths complete with your pretty family photos....like them all!!! No help there! I also buy right after Christmas, you can get the most amazing deals, and yes it helps to remember what you did buy lol Guilty! Merry Merry! They are all lovely so I'm no help in choosing just one! Great use of a great buy! Love all of these projects. Thanks for sharing. I like the middle card. Lovely ideas! If I chose one, it would be the second one. That looks flat and very easy to mail. Also, I like the grass in the background. Very nice cards. All such wonderful ideas! Absolutely adorable! Thank you for the inspiration! Beautiful family, I like them all but my favorite is the 3rd photo ornament. The photo, the beautiful red and gold ribbon and it would look good with both the red or gold die cut. I love all of thenm but my fave is the JOY one with the picture in the middle. Thanks for all the other tips too! can be of much help on your photo ornaments; I enjoyed them all. I must say the ribbon from Hobby Lobby is gorgeous! I keep thinking I've seen the most amazing cards ever and then I see yours so know I was wrong...your card is just awesome!! I love the highlights without going into too many details which people don't really want to read anyway. ADORABLE!! 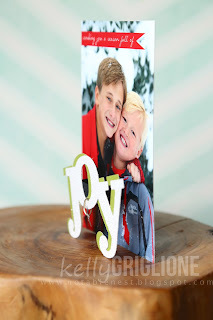 Great way to make photo ornaments! I like the one where you're all in the field. This is great. Fast and easy. 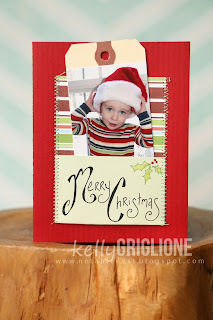 What a great idea to use Christmas bargains for your cards! My favourite is the one with Joy. Tho I know you prefer the photos close up. The photo of you all in green would match the paper you chose for the word joy if you swapped it in. So creative. Love them all but the 3rd one with the ribbon I like the best. All your card ideas are fabulous! Such a clever idea. I like the close up card, the one in the middle. Kelly, I'm WOWed by the assortment of photo-cards you've shared over the years; the list of 'highlights' is also incredibly impressive! Using wreaths for this year's version: brilliant! While all three are lovely, my favourite is the same as yours: the field photo. The gingham ribbon and gold joy are *the* perfect touches! Thank you for the impressive, heart-warming inspiration! What a great idea. This would make great ornaments with my grandchildren's photos. Please don't ask me to choose. They all look fabulous. I adore your tree review of the year idea. I think you should choose the field one as well. If it calls to ya, you gotta go for it :) Thanks for sharing! Oh, wow!!! Thank you for so many useful ideas. I luv your tree-shaped message. Love the year in review on the back! What a wonderful gift! Wow! 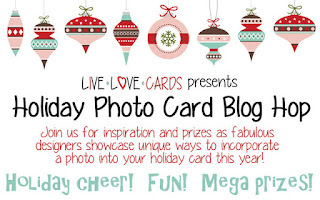 This post is full of amazing ideas for Photo Cards! 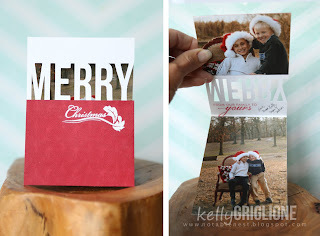 I love your bargain finds and how you turned them into such a fantastic multipurpose gift for your Christmas cards! I love shopping holiday clearance items. I might have an *ahem* slight problem. This cards are fabulous and your yearly updates are so fun! I love the wreath photo ornaments such an original idea. Awesome! 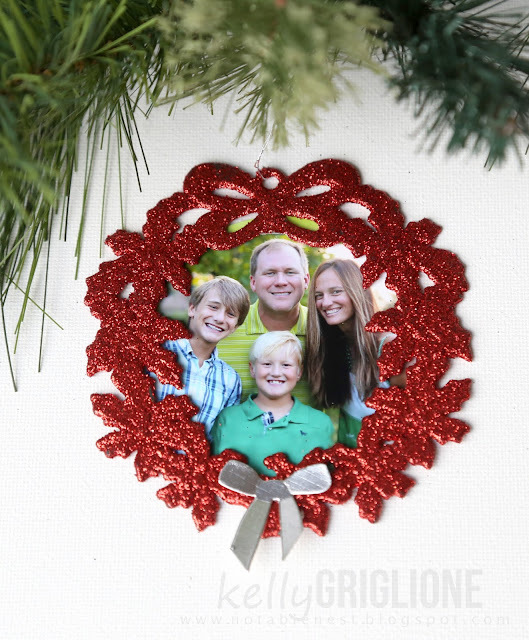 Such a great idea for an ornament and loved your year in review on the back, your family is beautiful! Good job on scoring those bargain wreaths, so cute with the photos in them! 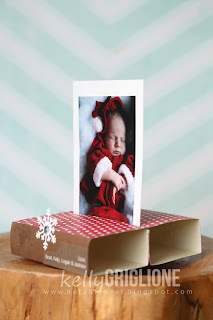 I absolutely love photo projects for the holidays! It's such a fun way of recording a family's history. All three of your choices for this year are awesome, but I personally prefer the second one - simple, easy to mail, and with a beautiful family photo! Love the idea of using clearance ornaments from the year before. I'll be on the lookout come December 26th! What a cleaver idea! Love the glitter wreath! Great ornaments.. a wonderful keepsake for years to come.. and thanks for sharing all your past photo cards.. they are great..
Love the idea of an ornament photo. They are gorgeous !!! Love your picture card ornament. Thank you for sharing your ideas. Great ideas! I love how you added your "year in review" to the back. Beautiful photo card/ornament in one! Congrats on your excellent after Christmas shopping too, with the ideas still flowing for the coming year! My daughter make a similar ornament for me when she was about 5. I still put the ornament on the tree every year, she is now 21. This brings back such great memories. Thanks for sharing! These are amazing. I love the one with the small silver bow. Even that photo would be my pick. Great shopping and organizing. Love it. I like the gold one best, because it seems cheerful, but they are all great! Thanks for sharing ideas! These ideas are SO amazing! I love how you found a way to use up your old stash, but I especially like the quick bullet points on the back of the photo ornament summing up the family's activities. I wish my family did this! I can't wait to try this! Super cute photo cards! My favorite was the wreath photo card, thanks for sharing. What a fantastic idea, I have seen these glittery wreaths in the Christmas sections. Great card. Wow a great after Christmas bargain turned into great cards. I would totally lose track of where I put them and forget why I bought them. I think that the one in the middle is the one for mailing as you suggested! It's perfect! But I also think that the one on the right side would be great for packages (tied to a package) as part of the wrapping and in town guests. Wow so many great ideas! I love the glittery wreath ornaments that hold the photos. I have used many things like that for Christmas gifts. Great idea! I love your cards. I especially love the backs and the updates from the family - and that you had the decade worth at the end! Cool! Also, you reminded me I bought something last year to use for my cards this year so yay!!!!!! a post chock full of creative ideas for using photos for Christmas cards!!! They are all so wonderful. As for your new one for this year- I really love the second one with the silver bow. It is clean, not so busy, and the photo is super. 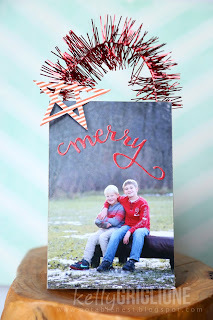 WOW your ornament cards are wonderful and this is such a fun blog hop!!! Wow - lots of great ideas in this post! I buy things at the end of season sales and forget about them. Kudos to you for remembering that you bought them and you actually used them too! 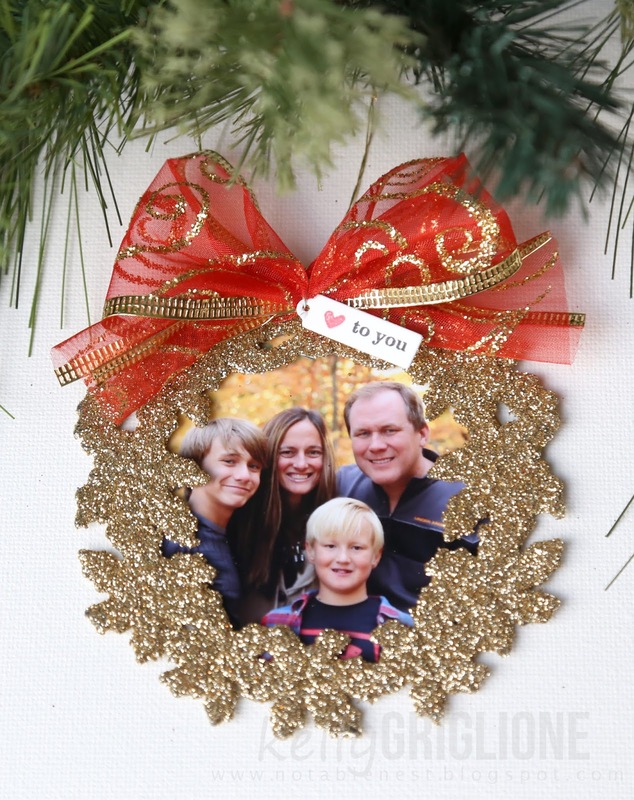 What a classy way to create a photo ornament for the tree! They're all great, but since you asked....I love the gold wreath with the close up picture of the family the best. Adorable ornaments!! I like the gold wreath one the best!! All great (even past years!) Love the wreaths. As for your questions: The pic of everyone is clearest in the 2nd (red) wreath, plus that one would be the best (less bulky) for mailing. Love the 3rd one but if bulky mail is a problem maybe you could use that style for adding to packages or hand delivering. Gorgeous cards. I love the bargain hunt story and I'm glad your organisation helped you use them for this years cards. OMG!! I LOVE the orderment the card is great Also! Thankso for the inspiration!! So Sweet - I would totally hang something like this on my tree if I got it in the mail - LOVE! Picture ornaments are my favorite! Love these...and nice families, too! All your cards look great! I love the close-up pictures the best and the ribbon at the top adds a nice touch! I like both the second and the third card. I would say the second one would be the best to mail. I like the way you made the bow on the third card. Great idea! I too buy clearance items in "hopes" of making future projects. The 2nd design is my favorite. It's simple but fancy. Amazing! I love your word tree idea, it is fabulous! Thankyou for sharing all of your previous cards too! I like the gold wreath card the best I think. I love that photo! Thank you for sharing not only the card you will be sending this year, but all the wonderful ones you'vd sent in years passed too! Your friends and family must look forward every year to receiving your fabulous creations! What great ideas for photo cards. 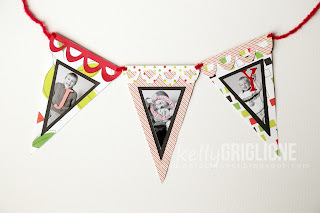 It is so much fun to hop along on this themed blog. It's a tough choice but I think the simplicity of the ornament with just the silver bow is my favorite . It's a great card and gift all in one! 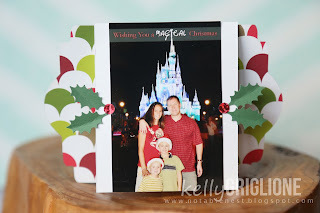 Wow...what a clever idea using the ornaments and incorporating them into the holiday cards. I like the middle and one on the right the best. Love the year in review on the back. Also, really enjoyed a look at previous years cards. Thank you for sharing. Wow! Such a plethora of fabulous ideas. Thank you for sharing them all. I really love the uniqueness of many of them and your current one is just wonderful. Fabulous design and smart move on your part to take advantage of an after Christmas sale. I like them all. Why not use them all? I know that some of my friends and family love traditional colors like red and green while others prefer modern designs. Maybe only make the ones with the bulky ribbon to those folks you will see during the holidays and hand carry to them or put on a little gift that you will be giving. Great card idea. My favorite one is the first one where you are in the field and dressed in blue. Very nice. I love the bullet points for your Christmas letter. Might use the idea for an insert this year. Thanks for sharing! What a great idea, I'll have to keep an eye out for the sales. I like the gold the best and also the photo in it. The autumn leaf background and the gold go beautifully together and it is a lovely closeup of your family. Love your ornament photo card, especially your year in review on the back. I like all 3 versions! How about making some of each? I like the idea of sending out the different styles. Love your year-in-review word tree on the back! What a clever and creative way to send a photo and save money too!! GREAT idea! Loving all of your photo cards! 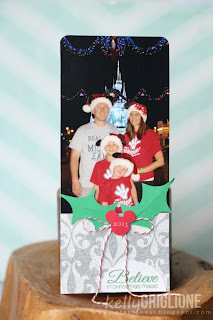 Great idea on using the ornaments for the family photo and the backside for the events that went on during the year! OMG! Such amazing projects!!! Absolutely stunning!!! I vote for the middle ornament (red wreath, silver bow, close up picture). Thanks for sharing! I must say you are a pro at making photo cards. Love all the ideas. I like all of the cards but I would go with the one with the gingham bow. I like that it can be used as an ornament. I get a family photo each year at Christmas and this would be a great memory ornament. Fantastic- I really appreciate all the background steps. Bargains are important! I like the gold card, but the middle photo - I like the photos that have the family faces up the closest. What great Christmas picture ornaments. Love the year in a tree on the back! I like your gold ornament the best and wonder if it's because your colors of clothes are darker in the picture. I'm thinking that if you used that same pic on the red wreath'd ones, they would catch my eye also. But no matter what, grammy's, Grandma's every where, just want to see their darlin's. Amazing creations!!! Love the year in review on the back!! Beautiful cards, love the ornament/card idea! Such a great idea to include year's details on the back! I usually give my family an ornament for the tree that reflects some significant event from the year, but never thought to actually document the event on the ornament.